Blue SDK RapidLaunch von OpenSynergy ist ein Linux-basiertes Framework für eine leistungsfähige und effiziente Bluetooth®-Entwicklung. Diese Lösung basiert auf dem Blue SDK Bluetooth®-Protokoll-Stack von OpenSynergy und einer Suite aus automotivebasierten Profilen. Blue SDK RapidLaunch verringert die Komplexität der Entwicklung einer Bluetooth®-Lösung für Linux durch die Konsolidierung der vielen APIs, die mit dem nativen Stack und Profilsets verbunden sind, in ein komprimiertes Set aus leistungsfähigen, aber einfachen APIs. RapidLaunch eignet sich ideal für komplexe Anwendungsfälle wie z. B. die gleichzeitige Verwendung von Profilen und mehrfache Geräteverbindungen. In Bezug auf die Bluetooth®-Entwicklung kümmert sich RapidLaunch um die komplexen Aufgaben. Das quellcodebasierte Produkt bietet Kunden Kontrolle und Flexibilität. Blue SDK RapidLaunch incorporates code that significantly reduces the number of APIs that are required in terms of controlling both the Bluetooth® profile and stack operation. Building on the Linux Quickstart features (transport interfaces, audio integration, PTY integration for serial port, and logging services) found in Blue SDK, RapidLaunch also provides DBUS objects that permit easy access to the Bluetooth® API from various application contexts. Dealing with mobile phone interoperability is one of the most challenging and costly aspects to account for when developing a Bluetooth automotive product. OpenSynergy’s highly experienced Bluetooth development team has taken into account the challenge of interoperability, reducing the engineering risk significantly. This application framework can accelerate time to market by reducing issues related to inter-device operation. 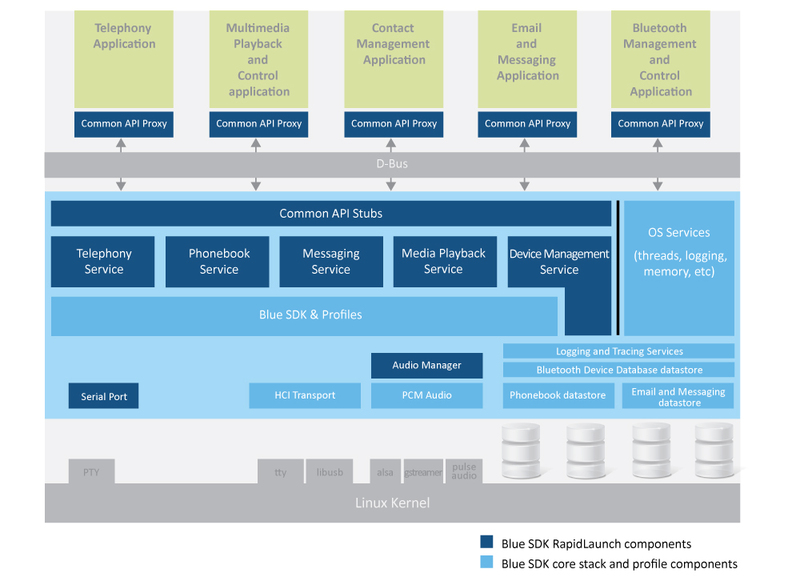 The Bluetooth stack (Blue SDK) and suite of automotive profiles (see list above) have been pre-integrated with RapidLaunch, reducing both development effort and cost, resulting in a decreased time to market. The Blue SDK and Profiles are individual SDKs that are purchased separately. Supports the GENIVI Bluetooth APIs using the CommonAPI and the CommonAPI tools.